Christina Wilke-Burbach PhD, RMT, CA is an educator, consultant, spiritual counselor, and holistic healing facilitator. She is a Certified Aromatherapist, Herbalist, and Master Gardener with over 20 years of higher education and experience in psychology, spirituality, holistic healing, and natural health. She has a PhD in Health Psychology, Master’s Degree in Clinical Psychology, 2 bachelor degrees in psychology and anthropology, a minor in Sociology, is trained in Transpersonal Psychology, and is a Reiki Master Teacher. She is a Member of the American Botanical Council, on the Board of Directors – Sheboygan County Master Gardeners where she is the current Vice President, is the Project Chair of the John Michael Kohler Arts Center Indoor Garden, teaches Continuing Education Gardening Classes at University of Wisconsin Green Bay, and is a supporter of organic farming and non–GMOS. 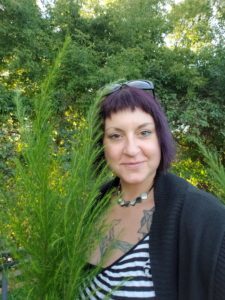 She is highly qualified to take you on your journey into Plant Medicine!